If you can imagine more pleasure, more intimacy, more aliveness... It's because you need it. But since no one's taught us to have the kind of love we long for, even amazing people with amazing lives wind up with relationships that aren’t as amazing as they could be. But that ends here. Your relationship can become its absolute best possible iteration and I can help. Whether you desire less conflict, more excitement, better communication, or new confidence, I'll help you create it. And even though we're working on your relationship, you don't BOTH necessarily have to work with me. *After many years of transformative work with business owners and leaders, people still seek and refer others to me for business coaching. My website and content no longer focus on that, but you can learn more about it by contacting me. - Or wanting to create better love & intimacy in a relationship, when they’re partner isn’t interested in coaching (or ready for it, just yet). We start with identified goals. I help you discern patterns and skill gaps that get in the way, plus the habits and approaches that will accelerate your progress. We track and touch base on progress monthly.It's flexible. I work with individuals and with couples, on both 1:1 and 1:2 calls. We design your program to match your coaching needs, schedule, and budget. It's convenient. Most of my work is via Zoom conference or phone, but I also meet with clients at my home office in N. Seattle and occasionally elsewhere. I mainly work during the day on weekdays, but also make some evening times available if that's essential. You make a decision, then rest into it. Once you've chosen to work with me and set your goals, we're in the express lane and you don't have to decide, "should we get off at this exit?" Your goals will tell you when you're done. Until then, your next session is in about 2 weeks, not "when we need it." This work makes a big difference, and often quite quickly, but part what drives our success is commitment: I'm "all in" from day one, and my clients get very committed within the first session or two. People do come to me wanting "just enough" to reduce their suffering, but after the first session, if that's still all they want, I share other resources rather than coaching with them. I'm direct, directive, fiercely loving, and I'll go to the mat with both of you. We'll waste no time with "just listening" or leaving you in the muck once we've identified what's not working. I'll show you concrete, effective ways out, and I'll tell you straight-up what you need to stop (and start) doing to create what you want. No "neutral 3rd party" here: I'll share specific feedback with both of you. It's refreshing and very effective. We maintain focus. We track your goals and identify behaviors we all agree will move the dial in creating those outcomes. You get accountable inside your relationship the way you've perhaps been at work or with your trainer, but probably never before in love. I won't let you drift if you lose the thread of what we're building. When things go better, you know why, and when they don't, you know what created the problem. We buckle up and stick it out, and we're glad we did. We meet at least twice a month for 4-6 months to create meaningful, durable change. After that, we finish what we started and/or then we graduate to periodic tune-ups. You pay for coaching by the month and we keep meeting in service of your goals, even if you have a busy month or go on a trip or are "doing better." That way, we never lose momentum, and you never lose track of what you're working on. Variable enthusiasm for the process is expected, but should never be confused with being "done" or the process "not working." Your commitment is to your desires, not to me. While I ask you to stay with your own growth process, you can quit coaching with me any time if it's not serving your goals, without pressure or financial penalty. 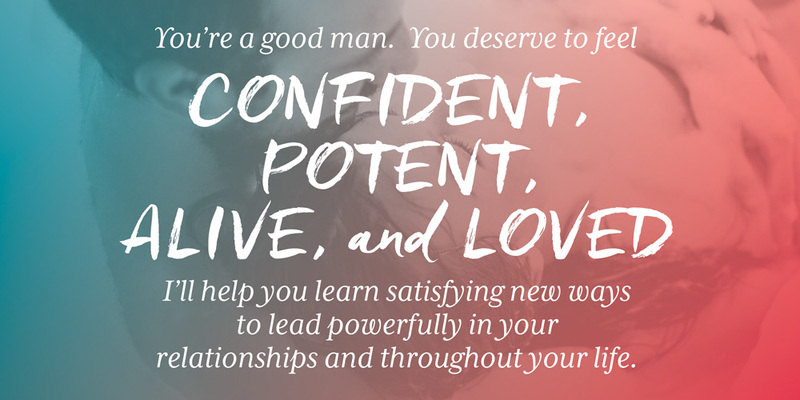 This 6 week course combines succinct training, expert Q&A, and a community of other powerful couples. 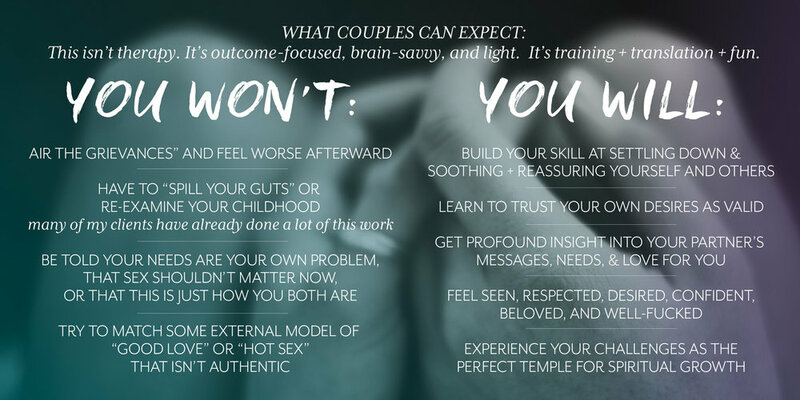 It's for couples who just want a light "tune-up" or individuals who want to build skill at giving and receiving the love they really want. You can join the waitlist for the course opening in late April. Couples can expect to invest $600 per month. The three of us meet for two 90-minute sessions per month for 4-6 months, initially. Many people create faster, better results by adding an individual 30 or 50 minute meeting with me every month or two. We start with a one-time, stand-alone coaching session. We get a genuine sample of what it's like to work together. The first time we meet, I want to learn about you, your desires, and your current situation. I ask a number of questions up front, starting when you schedule and pay. In our call, I'm both curious AND directive: I listen a lot but I also make observations, translate what you're not hearing from your partner (whether they're on the call or not) and teach ideas and skills that will make a difference in your results. You'll walk away from this first session with at least one concrete outcome: clarity on a decision, language for what you need to say, new understanding of a dynamic or pattern, or a plan for creating something new. 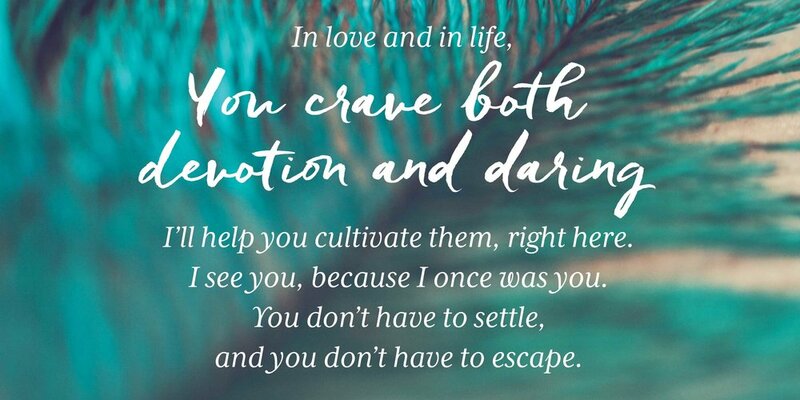 If you want to explore working with me with your partner, your first call can just be for yourself or it can be a 2-hour call for you both. If two people come together to the first session, we coach for about 90 minutes, but the appointment is 2 hours. I save some time to share what I'm hearing about your relationship, what you want, the skills you'll need to learn, and how I'd help you reach your goals. My coaching is on a monthly retainer basis. Relationship services are seldom reimbursed by health insurance. Some companies' employee assistance programs will pay or reimburse for coaching. You can expect profound results with a six month commitment; many clients work with me intensely for six months to a year and then ongoingly at a less-intense pace for several (or many) years with monthly, quarterly, or semi-annual sessions or private retreats. $650 - base monthly retainer, covers up to 2 60-minute sessions, plus email, phone, and text connection in between sessions. Longer sessions and more sessions will be prorated as needed. Thanks for reaching out. I'll be in touch shortly.